Nigeria’s economic situation is in “its worst possible time”, according to Finance Minister Kemi Adeosun. Millions of youths are indeed in critical economic conditions as recession continue to bite harder and unemployment rate increasing on a daily basis. The National Bureau of Statistics has reported that the country’s unemployment rate has risen from 12.1% in the first quarter of 2016 to 13.3% as at the end of the second quarter. In the report, the bureau said the number of people that were unemployed or underemployed increased from 24.4 million as at the end of the first quarter to 26.06 million persons in the second quarter of 2016. With glaring economic hardship, young people have become very restive and extremely violent in conduct at the slightest provocation. Recent happenings in many parts of Nigeria – Niger Delta, North East, Lagos, Kaduna, Kano and Katsina are clear indicators of violent extremism by young people. As youth unemployment continue to rise, kidnapping, armed robbery, and terrorism are entrenching themselves in the lives of restless youths who become both perpetrators and victims. Consequently, unemployment, economic hardship, poverty, drug-taking, and other crimes become the order of the day among these youths living in shanty slums. Bad friends and peer influence further lead to escalation of youth involvement in criminal activities such as kidnapping, drug trafficking, illegal fuel bunkering, cultism, political thuggery, 419, child-prostitution, gambling, and human-trafficking. We believe that with the current economic situation, a more rapid and result-oriented approach to poverty alleviation must be applied to empower youths living in slums in Nigeria. CVL (Centre for Values in Leadership) initiated a youth entrepreneurship, agro-processing and vocational skills acquisition programme that offers sustainable livelihood support and employment opportunities for youths in Nigeria over a 12 months period under the CVL Young Entrepreneurship Training Programme (YETP) – a national youth intervention programme. To be part of this youth empowerment scheme, the applicant must be a resident of the selected community and must be within the age brackets (18-to-40 inclusive). An applicant with a minimum of School Certificate or ability to read and write may be considered. The main goal of this project is to combat violent extremism and youth unemployment through youth entrepreneurship, agriculture, and Information, Communication and Technological engagement with the youths in Nigeria. Within 12 months enhance entrepreneurship skills of young people through entrepreneurship training, mentoring, and business internship. Within 12 months empower young entrepreneurs with start-up capitals to enable them establish, run and manage sustainable enterprises. Increase access to financial support for young people, through linkages to investors, credit banks, and other micro-finance houses for start-up capital and business growth/expansion purpose. Within 12 months, reduce youth restiveness and unemployment by creating job opportunities for young people. Agriculture-Agro-processing, Fish Farming, piggery, poultry, etc. Business and Entrepreneurship Training: The participants are enrolled for the 3month intensive training. The training will hold two or three times a week, totaling 16 or 24 days with a duration of 8hours each day. 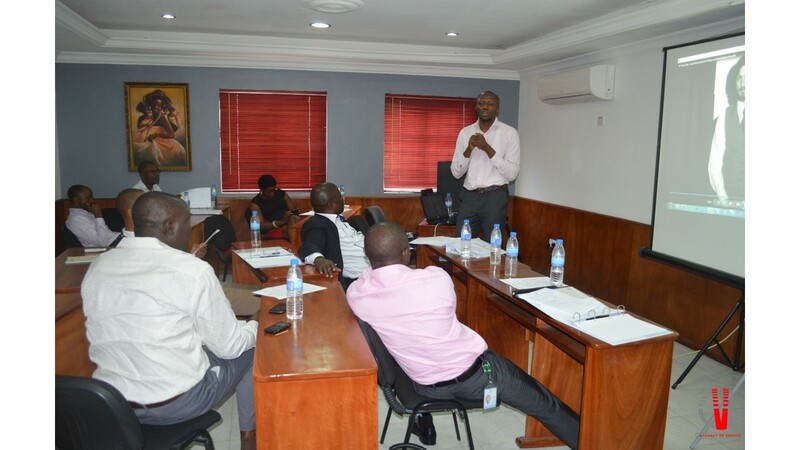 At the training, participants will be equipped with various business skills ranging from generating business ideas, feasibility study, writing business plans, to customer service, basic finance tools, personal development etc. Practical Internship with Business Mentors: After completing the 3-months entrepreneurship training, participants will be grouped/paired with business mentors in the same line of business for 3 months. Graduation/Allocation/Distribution of Start-up Capital: At the end of the 3months business mentorship, participants will be issued certificate of participation in entrepreneurship development. Each qualified participant will receive his/her start-up kits and/or cheque to start a new business or expand existing one. Increase access to financial partners through links to BOI, Heritage Bank, Sterling Bank, Fidelity Bank, etc. for single digit interest loan from the intervention funds. Reduced unemployment, violent and criminal activities youths are gainfully employed in enterprise development and now see themselves as role models worthy of emulation by other youths having now secured a sustainable means of livelihood. Project will be 100% delivered by CVL in partnership with other partners. l sincerely want to say Thank u for this opportunity been giving to me to be among the beneficiary. Your Comment *This will be a source of dream come true, please i need it. Please Sir /ma I will be grateful if this opportunity is given to me. Your Comment * i will so much love to be part of it, am interested in starting up q fish farming, please how so i join the next training. My Number is 08032457359. Your Comment * I will be very greatfull if i am part of this great idea, Am Omotayo Number 08186842950.
information communication technology i will like to study. Your Comment * how can I be among those whose get the opportunities. lll be glad. and grateful of the program. That is good and interested. we have entrepreneurship center at Sa’adatu Rimi College of Education Kano purposely established to engage such kind of youth with entrepreneurial skills that can enable them to be selves-employee but the major issue is asses to CAPITAL for the start up new ventures. the center graduated over four thousands students in every year. Am very happy with your effort and wish to assist such youth in our center, please. Good day Sir/Ma, I’m a youth corps member currently serving in Osun state, I’ll be grateful if this program is extended to Osun state. I’m interested in Fish farming, Snail farming and Cassava cultivation, Thanks. I want to be part of this oooh. it’s really good. Your Comment *Good day sir/ma!please I want to know when the next program will start because i am interested in fashion and designing and won’t like to miss out for this great opportunity,this my 07036032450. I will appreciate; if this kind of opportunity is also accorded to me. When is the next training scheduled? Please i’m interested in ICT section. pls I want to be part of this program. I will like to be part of this. I want to special in poultry. I would love to be a part of it too. I intend going into Fashion Design but i’ve been trying to gather fund which i’m still in the struggle for. I’m very sure this training would be of huge benefit to me because i’ve been looking out for such opportunity ever since. I hope i would be privileged to be a part of this. Thanks and God bless the organizers of this great and life changing program. Thanks for this wonderful opportunity. I would like to be a part of this empower program. I do like to go into fish production in Delta State. Your Comment *I’m interested in fashion designing. Thanks and God bless you for this wonderful opportunity. I would like to be a part of this empowerment program. I am interested in fashion designing and will be glad if I can benefit from this program. God bless u for this initiative. I’m really in need of a start up capital to invest in poultry & eggs. My contact is 07032912335,09090757990. I shall b grateful if u assist me. I really want to join please.. Please, when is your next training coming up!? I am very much interested. I am very intrested, pls inform me for the next training. Your Comment *Please when is the next training coming up? interested in the ict section. Nice to see some care for the future of this country. Am interested in this training. I am interested in the program. Kindly keep me informed. How can I be a part of the development, will also want to impact in my own way towards actualizing this project. Am Okwuchukwu Gloria, 07064957052. This is a very wonderful opportunity, I must confess i’m very much fortunate to have come across this great opportunity, I’m so much interested in diverting into the fashion industry.. Please help me see my dream through. Jabbless. irrespective of the venue in Lagos. I’ll be awaiting your reply,thanks in anticipation. pls I’m interested in this and I will like to do fashion designing. I will gladly appreciate this empowerment. sorry to ask why the training didn’t hold because I personally was interested in the course. I will be very glad to be part of this programme. Thank you. How can I be part of this wonderful opportunity. I want to participate am from Delta State. Please I want to be involved and tell my story too. Please can I be part of this entrepreneurial movement. Assistance needed please, thank you. Please I want to be part of this. Please is the application still on? Goodevening. Pls i dont no if the YETP is still on.